Project Insight has functionality to manage the work and expenses done for a customer and associate that to a customer invoice. This provides powerful reporting data showing what is being billed versus what should have been billed based on the actual work and expense done and what it cost. It also ensures that all work done to provide a deliverable is captured and can be reviewed and analyzed to ensure profitability goals are being met. Project Insight doesn't generate the invoice itself (with formatting and logos etc.) but it generates the data for the invoice; including the invoice header information (customer name, address, terms etc.) and the invoice line items (the work done or the expense incurred and the amount to bill the customer). Where Project Insight differs from a traditional invoice generation tool and where the power comes in, is that you are then able to attach the actual time and expense entries made on a project or against a customer to the individual invoice line items. The actual time and expense entries can even be used to automatically generate the invoice line items saving time and increasing accuracy. That data can then be exported or integrated to your ERP or accounting system or invoice generation tool for creation and management of the actual invoice (although there is some invoice management functionality in Project Insight for simple invoice management). Only Users with the Time, Expense & Invoice Manager role checked can create invoice records. 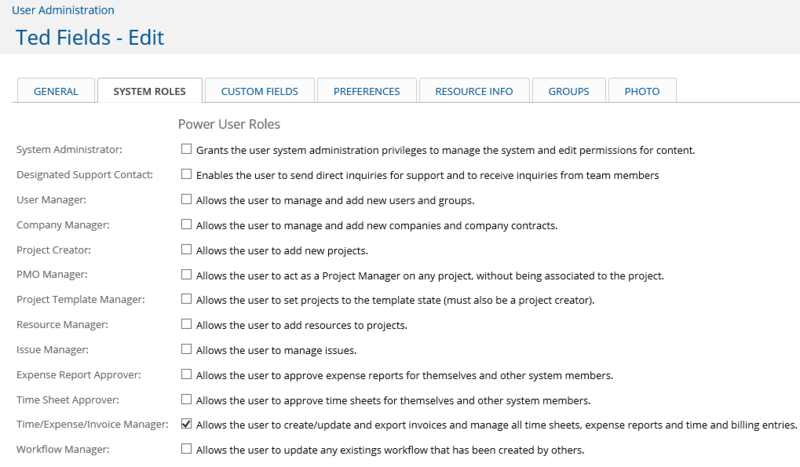 See User System Roles for more information. The Time, Expense & Invoice Manager can view all time and expense entries in the system and add them to an invoice record even though they may not have access to the projects themselves. An invoice record and the line items can be created as required, however, In order for a time entry or an expense entry to be included on an invoice, it must have been entered by the resource (or project manager/scheduler), it had to have been submitted for approval by the resource and it must be approved. The time and expense entries must also be associated with a company, either directly or via the company being assigned to the project that the time or expense entry is made against. See Time Approval Work Flow for more information. If a user is a Time, Expense & Invoice Manager, an Invoice Records menu option appears in the left navigation. 1. Click on the Invoice Records menu option in the left navigation to expand out the sub-menus. 2. Click on Invoice Records. 3. The invoice records list is displayed. 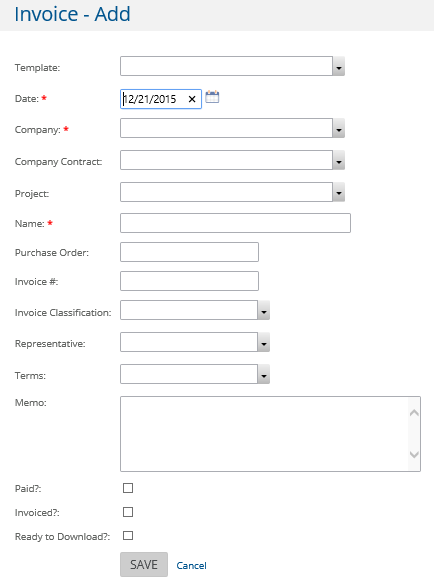 This list may be blank if no invoice records have been created in the date range applied to this list (i.e. invoice records may exist, but they just not being displayed). 4. By default, only invoice records for the current quarter are displayed but that can be changed with the Display and Filter Options (see that section below for more details). There are two ways to add an invoice record, using inline editing right on the list or via the invoice record add/edit form. 5. To add directly from the invoice record list. a. Click in the highlighted blank line on the form and enter the details. b. The standard columns for an invoice record are displayed by default but you can also change those with the Display and Filter Options. 6. Click the Add a New Invoice menu option. The Invoice Add/Edit form appears. The only required fields for adding an invoice with either method are the Date of the Invoice, the Company that you are billing and a name or description of the invoice. Paid - If Project Insight is being used to manage invoices, use this flag to identify whether or not this invoice has been paid. If another system is being used for invoice management, this can be ignored. Check or uncheck it as appropriate. Reports can be run for paid or unpaid invoices. Click the Save option on the invoice line if you're adding it directly on the list. After you have created your invoice record, you will see it appear in the list. You are now ready to start adding the individual invoice line items. Each invoice record will contain line items. These are the details on the invoice that the customer sees. It usually describes the work that the customer is being billed for, the quantity, amount per and total amount. Each invoice line item can have actual individual time entries and expense entries attached to it. Invoice line items can be created manually or Project Insight can do it automatically based on criteria that is set. Doing it automatically makes it very easy to generate the invoice details and attach the individual time and expense entries to it. Doing it manually provides you with finer control over what is entered. 1. To create an invoice line item, click the invoice name in the invoice list. 2. The Invoice Line Item Add/Edit form appears. See Invoice Record - Details for next steps. By default, only invoice records for the current quarter are displayed on the Invoice Records list but this can be changed with the Display and Filter Options setting. The columns of data which display can also be changed through this option. 1. Click the Display and Filter Options setting on the invoice records list. 3. Change the Columns of data that display if required. Click on the Table Column Selection Options to expand that section out and set the columns. The settings will be remembered and applied the next time the Invoice Records list is displayed. To delete an Invoice Record, it must be displayed in the list. 1. Click on the Delete icon next to the Invoice Record to be deleted. 2. A confirmation prompt will appear, confirming that the Invoice should be deleted. Click OK to continue. Any time or expense entries attached to the invoice will be released i.e. they are made available to be attached to a different invoice.